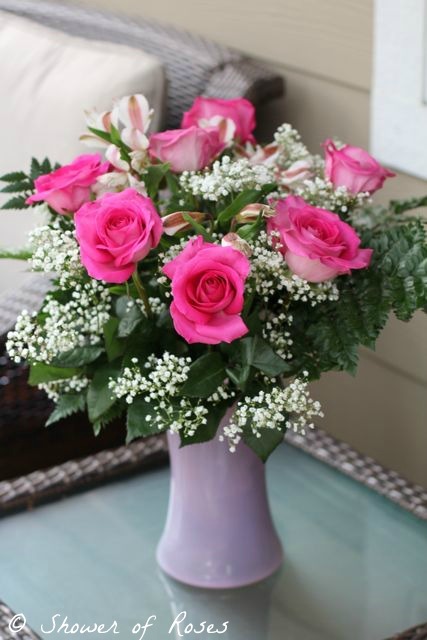 These beautiful roses, sent from a friend, arrived Tuesday afternoon! I only have a couple minutes since I am watching my little niece again today and have a birthday party to get ready for tomorrow, but I wanted to thank you all again and give you an update. It was a difficult couple days, as I waited for the results from my ultrasound, but last night the doctor finally called with some good news! Everything looks normal and they didn't see any liver damage, tumors, or other problems. We still don't know what's causing my high numbers and symptoms, but now all the really scary things have been ruled out! Thank you all so very much for all the prayers. I know they made a difference! I have a friend who lately had been very tired and was having neck pain. This week they found that her liver counts were high and now suspect it was all a result of a tick bite. Might be something to consider. Praise God! I've been keeping you in my prayers...will continue to do so for answers and healing. Oh Jessica, such good news. It's so hard to wait for test results! I hope they're able to figure out all of it soon. And thank you for letting us know Jessica, such wonderful news. Enjoy your day! Thank you so much for the update - you have been in my thoughts and prayers a great deal these past few days. So glad the news was good. Jessica, Thank God!!!! I have been checking your blog every couple of hours for the past two days to see any updates. So if your visitor counter has jumped exponentially, I apologize that there really aren't an extra 100 people logging on, it was just me...LOL. I have been praying and had all my friends praying. I will continue to pray. I am just so glad that everything serious has been ruled out. God bless you. Enjoy your weekend. Oh, just a PS about the book. The group that published it is the same group that produces Community Playthings toys and furniture that are all handmade in Upstate New York. Just thought you might like to know, always nice to discover USA toy makers. I started crying when I heard the good news. I am relieved to learn that your tests came back fine. You have been in my prayers. You might want to have your doctor test for candida albicanis. It can cause extreme fatigue. Just a thought....my husbands aunt was having similar symptoms, really tired and neck pain. When she went to the doctors they ran some blood and her liver was completely out of whack. It came down to a certain kind of tick bite, not lymes disease but something to do with some strand of malaria. I guess a certain kind of tick bites an animal that has it and then bites a human that's how it transmits. So now she is taking antibiotics for the next 3 weeks for it. Anyway, you popped into mind when I heard about it. Praying for you! Jessica, So sorry - I'm finally stopping by! I did a bit of back-reading, and know of my gratitude prayers on your behalf praising God. Will continue to pray that all remains well, and that your body's numbers get back to 'normal,' too. So glad your medical report was good. I have had high liver enzymes since 1985, and no reason why. Sometimes they go up a little and sometimes down. I have blood work done regularly and watch my alcohol consumption and am thankful daily that all is well. Continuing prayers for your good health. Thanks be to God! St. Therese sent you roses again! Isn't she amazing?!! So happy for you! Now to figure the rest out. I also have high liver counts; attributed to nothing...they go up with lack of sleep and illness. May St Anthony help you find the problem! !